A couple of weekends ago we spent some time at a friend’s beach house in Florence, Oregon. We were expecting a relaxing weekend on the beach. Ya know, sand toys, bubbles, a good book, maybe dabbling in the water. Suntans and swimming suits. Beach stuff. Like San Diego and Maui, right? Wrong. What we got instead was a fantastically surprising adventure. I have heard that the Oregon coast can be cold and windy. I am here to tell you that, yes, indeed the Oregon coast can be cold and windy. Extremely so. Shortly after we pulled into the beautiful beach house we set out for the beach. We loaded up four beach chairs, buckets, sand toys, and a couple of beach towels onto our arms and shoulders. It was early May, so we figured we would leave our swimming suits behind because we probably wouldn’t be getting into the water this time. We were foolhardy. Any of the residents who saw us set off toward the beach loaded down as we were must have shaken their heads and felt sorry for us. The walk to the beach was an adventure in itself. We walked to the end of a road to find a path that descended into a swampy region where the nearby Siuslaw River empties into the Pacific Ocean. This path was aptly named the Hobbit Trail. Before we knew it we were walking on a board walk through a 6-foot high tunnel that had been carved from the swamp trees. It was dense and dark and narrow. It was awesome. The Hobbit Trail then opened up 20-foot high sand dunes. Suddenly we went from swamp to Tattooine. 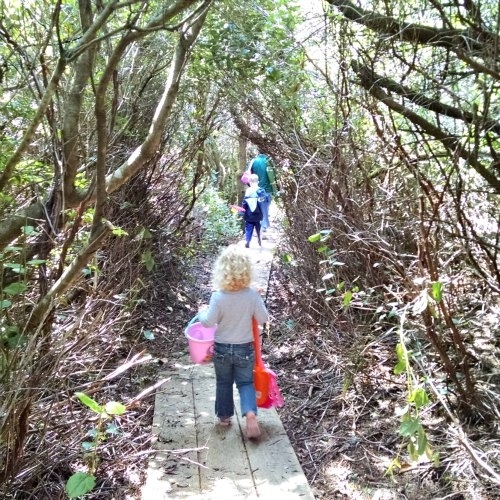 The path was nearly too steep for our three-year-old to climb up, even on all fours. Ben and I carried all our stuff, including now kids’ shoes. The wind picked up with each step we took toward the ocean. 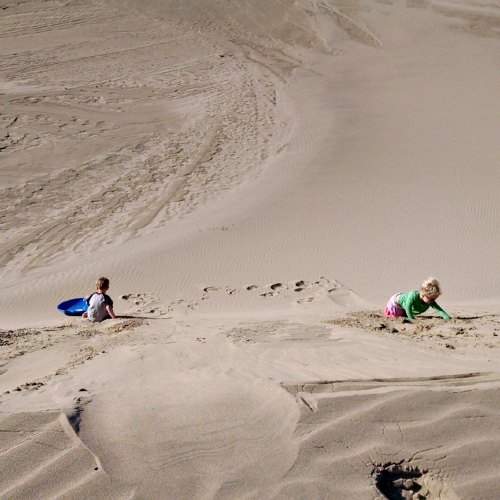 We went up and down sand dunes a few times before it finally opened up to miles of flat, sandy beach. “We made it!” we shouted. As we stepped out from the protection of the dunes the wind ripped into us like I have never felt before. We estimate the winds were coming in around 45 mph at that point. I held onto my three-year-old’s hand, fearful she would get carried away with the wind. At one point I dropped a beach chair that was folded up and it started bouncing down the beach like a plastic bag. The wind drove the sand into my ankles like a thousand tiny hammers. We all walked sideways toward the water to shield our faces from the wind and mouthfuls of flying sand. Ben was determined to get to the water. He was smiling and laughing like a madman. He LOVED the adventure we were on. I wasn’t so sure. The wind kept getting stronger and stronger. I couldn’t imagine having any kind of fun in that kind of weather. We finally decided to turn back to the dunes where it was still windy, but less so. Ben eventually went back to the ocean on his own to touch it once before we left. The kids were amazing. I didn’t hear one word of complaint from either one of them. If anything, I was the party pooper of the group. 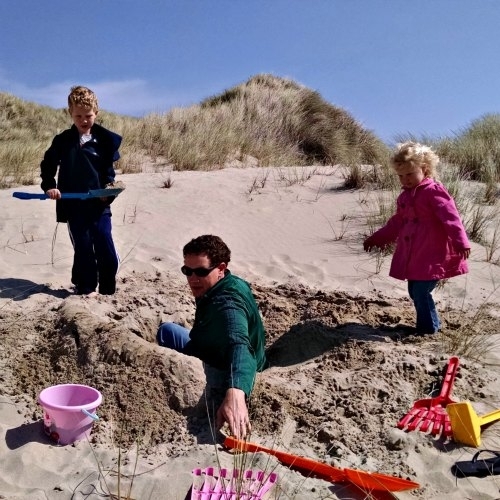 While Ben and the kids played in the sand and dug an epic hole (one that all three of them could fit into) I huddled under a beach towel for warmth and tried to wear a smile. The next morning we woke up to perfectly sunny and calm weather. We rushed out of the house to enjoy it before the wind rolled in again. This time we drove down the street a bit to a different, bigger set of sand dunes. 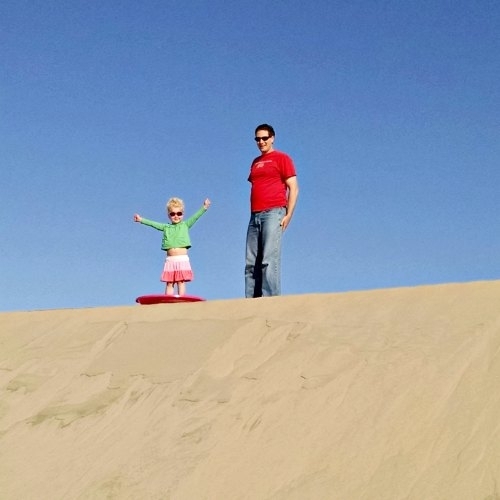 We bought toboggans and had a blast sledding down the dunes, running back up, jumping off, rolling down, racing up, sliding down. We spent a couple of good hours playing before the wind kicked up again and it got cold and sand-in-the-face again. There is nothing quite like letting go of all adult inhibitions and just playing like a kid. Just letting it all out, holding nothing back. I find that I am often too serious in my life. I don’t stop to play. I enjoy my life and I love watching my kids play, but the times that I actually run, jump, roll, slide, and laugh like a kid are rare. If nothing else, this trip gave all of us the opportunity to do so, even if just for a few hours here and there. So if you are planning to visit Florence, Oregon anytime soon, be sure to check the weather before you go. And if it is a windy time of year, wake up early and get to the dunes before the wind picks up in the afternoon. Remember to let go of your inhibitions and laugh and roll around until you find sand in all the strangest areas of your clothes and body! This was in fact, the best trip. So fun! What an unexpected adventure! The only time I got to the OR coast it was so overcast and foggy you couldn’t even see the ocean. Thanks for sharing and reminding us all that we should embrace these unexpected adventures!